Not all things are produced in Ethiopia. Those it does not produce, Ethiopia imports, especially wealthy ones, although Ethiopia has been a country — even during its double-digit growth years—a country that has never known—forget abundance of foreign exchange—not even half a year’s supply! We all know now the earnings from good years of growth, as reported by international sources, were spirited out of the country. Consequently, there has always been scarcity of sugar, oil, wheat, medicines, schools supplies, building materials, etc. The prices of those products are determined — theoretically by the market. However, during the past 27 years Ethiopians have known, at least better than TPLF’s revolutionary democracy and its developmental government, wherever the market is properly organised and law-governed, it has invariably determined the prices of goods based on their quality and availability— not mischiefs. In the Tigray market, today there is only one buyer. It’s also the same seller — the TPLF and its EFFORT! Part of the dilemma of Ethiopians now is also the fact that, as citizens and in keeping with past feudal and un-transparent political tradition, the Abiy Administration has been tight-lipped on the terms of trade it has entered into with Eritrea— in particular the Nakfa exchange rate regime— which is fraught with future troubles for Ethiopia-Eritrea commerce. As administrator of Tigray Region, what has the TPLF done to address the current problem of scarcity of fuel, as Eritreans drive into Tigray and, in keeping with their individual needs, relieved their fuel problems their country could not provide? The action by Eritreans is consistent with that of all humans in situations of scarcity and excessive shortages! Everything I state here is not in any sense directed against the people — but TPLF greed and blindness. Note that Daniel Mekonnen of the Tigray Urban Development, Trade & Industry Bureau told The Reporter “The problem needs a solution”. This situation arose in Eritrea, partly because of the disability the TPLF has brought upon them! Was the TPLF held back from acting as supposedly as state leader, or is it disabled by its guilt, under the current circumstance? Or this situation arose because some TPLF members saw this Eritrean pressing need for fuel and other products as their source of enrichment: by selling for Nakfa and turning it into dollars and keeping in foreign banks? It’s possible the TPLF may have focused on its own solutions that as usual serves its interests— not of the people of Tigray! For that, it has equated regulating the situation with leaving the door wide open for our Eritrean brothers to come and exhaust the meager supply of fuel and etc., which Ethiopia imports with its depleted foreign exchange resources! Why this TPLF generosity now to the People’s Front for Democracy and Justice (PEFDJ), as if it had not been persecuting it at all international fora until less than half a year ago, including advocating sanctions not to be lifted? One only needs to consider the report of the United Nations Somalia Eritrea Monitoring Group (SEMG) to the Security Council (S/2017/924) of November 2nd, 2017. In its paragraph 229, the SEMG recommended for Security Council action of “disassociating the Eritrea and Somalia sanctions regimes.” This was because it had found no evidence of Eritrean terrorism in Somalia or anywhere else in the Horn of Africa. To be honest, in the circumstances I don’t have the fullest answer to any of the above questions! Nonetheless, skepticism being a second nature to Ethiopians, i.e., without dropping any hints, today most Ethiopians prefer to distrust the TPLF ‘gesture’ to Eritreans. As a political force that finds itself caught between its present opportunism toward Eritreans and mortal enmity to the reformist Ethiopian group in power at this moment, it’s only contriving, if it could, to bring down the administration in Addis Abeba. In that, its strategy is two-pronged. It aims at frustrating the unfortunate Tigrean people with scarcity. For over half a century, it has been masquerading as their protector, although now treating them as collaterals. While paying lip-service to Eritreans, TPLF strategy is to bring down the Abiy Ahmed Administration. Meantime, all known TPLF criminals would, with consent of the mafia organisation, continue to use Tigray as their hiding place from justice! It’s my earnest hope Ethiopians and Eritreans would strengthen their fraternal ties in peace and dignity! Aug 10 Addis Ababa (AFP) The United Arab Emirates (UAE) will build a pipeline connecting Ethiopia to the Eritrean port of Assab, state media reported Friday. In a surprise move in June, Ethiopia’s new reformist Prime Minister Abiy Ahmed announced he would finally accept a 2002 United Nations-backed border demarcation, paving the way for peace between the two nations. Reciprocal visits by the two nations’ leaders led to the resumption of flights between their capitals as well as the opening of embassies and phone lines. በ1983ዓ/ም ወያኔ ዓሳራ “ግመሎቹ ይሄዳሉ፣ ውሻዎቹ ይጮሃሉ!”ይል ነበር፡፡ከ2008ዓ/ም ጀምሮ ሕዝብ “ግመሎቹ ይጮሃሉ፣ ውሻዎቹ ዝም ብለዋል!”አላቸው!!! 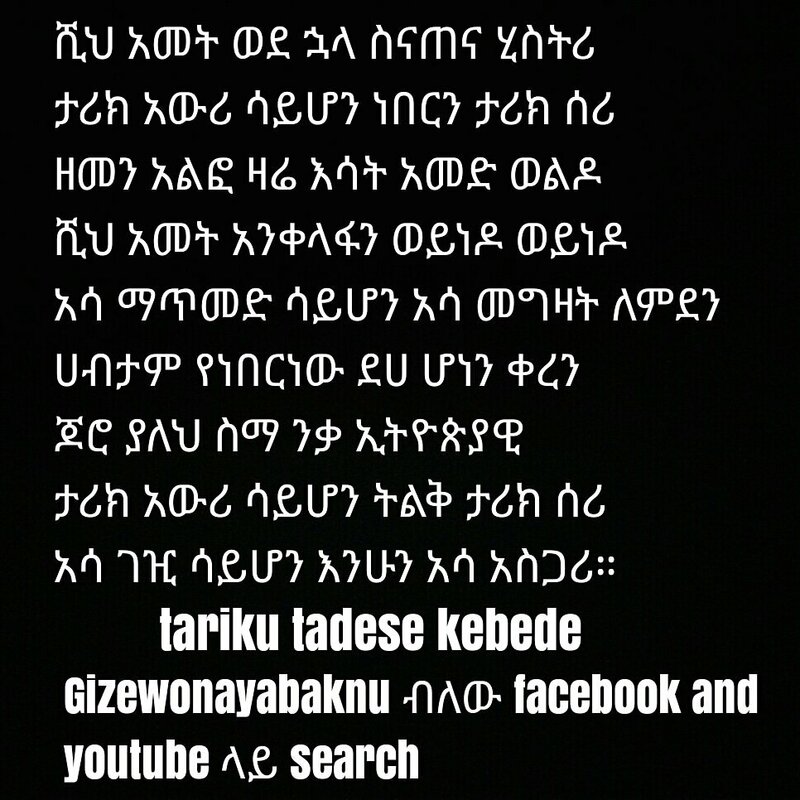 የዴሞክራሲና የፀረ-ዴሞክራሲ ኃይሎች ፍልሚያ !!! የኢትዮጵያ መከላከያ ሠራዊት ከካንፑና ከምሽጉ ቀበሮ ጉድጎዱ ወጥቶ በእንቁጣጣሽ ከቤተሰቦቹ ጋር ይቀላቀል!!! አድርባይ ምላሳዊ ጋዜጠኞች ይወገዱ!!! የኢትዮጵያና ኤርትራውያን ህዝቦች ወዳጅነት ይጠንክር!!! የዴሞክራሲ አብሪ ጥይቶች በሃገራችን ሰማየ ሰማያት ላይ ተተኩሰዋል!!! “The signature of the Joint Declaration of Peace and Friendship represents an historic and courageous move by Eritrean President Isaias Afewerki and Ethiopian Prime Minister Abiy Ahmed. Breaking a twenty year old deadlock in bilateral relations, it raises unprecedented prospects for reconciliation and paves the way for enhanced regional cooperation and stability in the Horn of Africa. “The United States welcomes the July 9 commitment to peace and security between the State of Eritrea and the Federal Democratic Republic of Ethiopia, effectively ending 20 years of conflict. We commend Prime Minister Abiy of Ethiopia and President Isaias of Eritrea for courageously leading their citizens towards peace, prosperity, and political reform. The normalization of relations and the adoption of the Joint Declaration of Peace and Friendship between Eritrea and Ethiopia will provide their peoples with the opportunity to focus on shared aspirations for closer political, economic, and social ties. It is no surprise that since June 18, 2018, the famous quote by the English novelist Charles Reade: “Courage, mon ami, le diable est mort! (Take courage, my friend, the devil is dead!) has been on my mind. After listening to Prime Minister Abiy Ahmed that day in parliament, his pledge to institute the rule of law —”Presumption of innocence until proven guilty”— for the first time ever in my life has made me trust our nation’s leader and as such identify myself with him. Thus, the pinned message on my twitter page now essentially reads: ABIY AHMED OUR PRIME MINISTER in the context of rule of law! In response to Ethiopia’s acceptance of in its June 8, 2018 statement of the December 12, 2000 Algiers Agreement without any precondition, Eritrea too has today broken its silence and has expressed interest in sending a delegation to Addis Ababa for the necessary peace talks. On account of what Abiy has demonstrated to date, more particularly inside the TPLF parliament last Monday, Eritrea seems convinced its infamous foe, the ‘clogger’ of peace to date now belongs to Ethiopia and Eritrea’s past. By the will of the Ethiopian people, the TPLF regime is very likely out of commission. However, there can be no certainty it would not try its usual mischiefs, as it has already been trying to fan ethnic tensions and conflicts. However, the prevalent mood in the country is, as stated in my response to similar concern Tuesday, the risks are more for the TPLF as well as the responsibilities for the consequent conflagration, leading to its final termination! “We will send a delegation to Addis Ababa to gauge current developments directly and in depth as well as to chart out a plan for continuous future action…The Eritrean people, but also the Ethiopian people, have lost an opportunity of two generations for over half a century”. Prime Minister Abiy Ahmed has responded positively, according to the Post, expressing “his readiness to welcome warmly and with considerable goodwill the Eritrean delegation.”We have heard in the past, the evidence for Eritrea of Addis Abeba’s acceptance has been Ethiopian troops withdrawal from Badme. Now, I feel, there may have been quiet contacts between Addis Abeba and Asmara for some time to return to status quo ante 1998. I strongly feel that this Eritrean positive response comes after Prime Minister Abiy Ahmed has exorcised in public in parliament on June 18, 2018 the 20 year-old demon that has locked Ethiopia and Eritrea into a permanent state of conflict. Abiy seemed to level the fault for this on the TPLF. He accused the Front of squandering a poor nation’s resources, as if acquiring the latest sophisticated ground and air warfare weapons could secure peace. It only proved a hindrance to peace, while it was too much, costly and burdensome for a country of 105 million population against a nation of 5.2 million. It is the case, I presume, possibly the prime minister’s first extensive reporting to parliament on the overall Ethiopian situation, with emphasis on the importance of sustainable peace with Eritrea that must have helped sway Eritrea to end its wait and see attitude. I learn from my senses and close friend’s reactions to Monday’s development, i.e., Abiy’s vision, his logic, transparent approach, seriousness and the courage of his profound conviction have done the magic, gripping Ethiopians at home and abroad, possibly infecting Eritreans too. The sense amongst the majority of Ethiopians today is optimism, at last finally better days are coming. On the other hand, before our eyes, the TPLF has taken humiliating beatings with the truth and revelation of its injustices against our citizens and the nation. Therefore, for almost everyone the awareness of the possibilities of becoming one and whole again for real. Equally important are the lessons from the past that remain valid: this wholeness must be constructed on the solidity of mutual respect, equality, freedom, rule of law and respecting the dignity of each and every Ethiopian, fully restored where infringed and wholeness within every citizen’s reach. Instrumental for the prime minister in doing his ‘healing’ is his now popular approach “መደመር”! It literally means, to be added, in the sense of readiness to pull together. The prime minister believes his “መደመር” ensures sustainable peace, beat poverty and facilitate true development of Ethiopia, or a group of nations working together toward the same goal of changing the lives of their citizens. This “መደመር”, Abiy has been harping from day one since he set foot on the political scene on April 2, 2018. In its deeper meaning “መደመር” implies being conjoined, as one people i.e., to live in sustainable peace that facilitates working together toward enabling our people(s) to live qualitatively improved life. This represents a complete departure from the nearly three-decade-old ideology and state politics of the Tigray People’s Liberation Front (TPLF). We saw in Ethiopia through its white lies and its mafia-esque robbery, ethnic politics has been TPLF’s goal of fragmenting society into its lowest elements, which literally is its war game, its strategy aiming to divide and conquer even relatively stronger party, eventually reducing it into its prey. For Abiy, what“መደመር” or being conjoined means, Ethiopia internally achieving unity and cohesion— to stand as the Ethiopian nation and state. As pertains to the Horn of Africa sub-region, four days before reporting to parliament he was in Somalia. On his return, Abiy offered his vision for Ethiopia and Somalia. His effort is to spread his “መደመር” Gospel, that is replicating the same amongst Ethiopia’s neighbours. This he said would create better opportunities for the peoples of the Horn of Africa, a sub-region to date known for its restlessness and wretchedness of life. Because of my familiarity with the situation in Somalia, I am more surprised by the degree of welcome accorded to Prime Minister Abiy Ahmed to his “second home”. There is also the affirmative response of President Mohammed Mohamud to the Ethiopian prime minister’s “መደመር” Gospel, already affirming Somalia’s readiness to work full time to benefit from economic integration as it his nation’s objective! In formulating this, Abiy’s starting basis is the shared commonalities between the two nations, which capitalises on shared ethnic origin, culture, religion and history, as he put to Somalia’s leadership! Speaking of his approach for peace between the two brotherly peoples of Ethiopia and Eritrea, Prime Minister Abiy emphasised each and every exercise for peace heretofore has been exploited for political ends. Abiy’s maturity and his reflection in everything leaves its traces for everyone to see. He has repeatedly acknowledged what has propelled him to office is the citizens’ opposition to decades of TPLF mode of governance by state violence, official burglary and torture and terrorism against the people, as he has put it, ‘the terrorism of those in power’. “If Ethiopia does withdraw its troops from the Eritrean territory it still occupies, a key excuse for Mr. Isaias’s iron rule will be removed. His admirers hope that he would grab any historic opportunity for real peace with Ethiopia to display once again the visionary leadership that defined him as a freedom fighter and reset his management of the country. While there is always that possibility, this time I would like to believe the author Michela Wrong is wrong in subscribing to this view in this situation. I strongly believe Isaias is too foxy to recognise pulling the strings too tight this time would be against his sole interest — spending his last days in power! What has surprised me most is the silence of the United Nations secretary-General preferring silence on this Ethiopia-Eritrea peace overture! Recall that the United Nations had managed the United Nations Mission in Ethiopia and Eritrea (UNMEE) peacekeeping mission between the two warring nations from 2000-2008. The meaning of this silence has eluded me. The UN knows and Ethiopians know full well that the TPLF has been accorded, to the misfortune of the United Nations, the running of one whole UN peacekeeping force—the United Nations Interim Security Force for Abyei (UNISFA), free to exercise its ethnic discrimination practices since 2011— including its designation of force commanders, deputies and other officers, as I had tried to bring this breach of Charter principles to the attention of all concerned. What is more worrying is murderer TPLF officers assuming responsibilities as UN peacekeeping commanders, as I had made known in 2018 in Part I and Part II of my articles on the subject. ልቡ በሃገሩ ፍቅር የነደደ ወጣት ታሪኩ ታደሰ ከበደ በግጥሙ ያደረገው ብሔራዊ ጥሪ!